While on vacation in Door County, Wisconsin in July, I lucked upon finding a mint condition, unused Pentax P3 35mm SLR for sale at a consignment shop. It came with a 50mm f2.8 and a 35-70 f4.0 lens and bag, and was a really nice find. When I went to put in a roll of film for the first time, it still had the “remove before first use” decal above the film tray – practically a brand new camera! 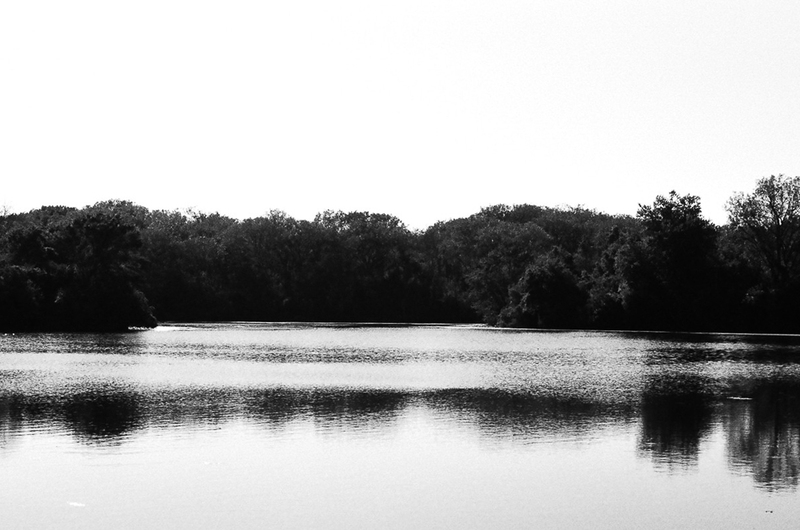 As I took photos with this first roll around Chicago, and at the Skokie Lagoons in Wilmette, I really enjoyed the fact that i had to slow down, and put some thought into what I was shooting in a different way than with a digital camera. Holding a film camera that didn’t give me a virtually unlimited number of shots, however limiting it is, felt liberating in a way. The not knowing whether a shot would come out well felt great as well, like I’d be living in a mystery until the photos were processed. I think this was the first photo I shot with the P3, from inside Central Camera on Wabash. The architecture of the IBM Building on the Chicago river, located beside the iconic Marina City towers, made for some excellent contrast between windows and and the black metal of the building. I’ve taken dozens of photos of this with my iPhone and Nikon cameras in the past, and none of them resonated with me like this one. On a drive home from working in the suburbs one evening, I had a chance to stop through the Skokie Lagoons in Willamette. I try and swing by here each season, especially in winter when the lagoons are completely frozen. It’s a nice quick escape from the highways and roads of the north suburbs. This was taken on a Sunday afternoon while out for a walk with my daughter. Numerous sailboats were coming into Belmont Harbor as the winds picked up on a really overcast day. This is one of my favorite spots to sit along the lake, or to jog along the breakwall. I’d been wanting a film camera / B&W film setup for a while for street photography, which hasn’t ever been a big focus for me. I’m trying to keep it on my as often as possible, and random moments like this, no matter the quality, end up being a nice reminder of something that was eye-catching enough to commit to film. It really reinforces the fun that can be found in looking around with your own eyes, finding a balance between split-second moments, and compelling scenes that warrant some planning. I looked around a lot for a good mail-in processing shop, and went with The Darkroom in San Clemente, California. They process film, and make them available online for download, along with sending the negatives back to you with a CD-Rom of the photos. I was more than pleased with the results and look forward to using them frequently.